carriewriterblog: 3 Pesky Technical Issues I Just Solved -- Any of these Sound Familiar? 3 Pesky Technical Issues I Just Solved -- Any of these Sound Familiar? You know that sinking feeling. ..you're happily sitting down to what you think will be a productive session on your computer, when suddenly things are not going right. One of your favorite applications is for some strange reason not working, or you're getting odd messages from your screen, or even worse, you can't find an item you just bookmarked or saved. In the last two weeks I've troubledshooted some interesting challenges, and it feels good to have resolved these issues -- like cleaning out the clutter in your closet, or hiking that steeper trail, or trying out a fancier recipe than usual. Not to sound dorky, but it is empowering. Constant Contact's new editor is great, but make sure you're in the latest version of Firefox to use it. The Good News: Constant Contact needed to change its editing software, although I have been a fan of this platform for 5 years now, and that's after researching over a dozen e-mail newsletter programs. The new editing features provide the user with a handy drop down of the editing palette so it's more accessible. The image editor also has better functionality, allowing users to move or resize an image by clicking directly on it, whereas previously you had to Save, go into the image editor, and reload the image, which was a lot more time consuming. The Bad News: When I went ahead to get started on my September issue, the program didn't work. I could set up a template, but the new editing toolbar did not pop up, so I was textless and formatless. Not so good for a newsletter. So, I contact Constant Contact's support via e-mail, and they did get back to me quickly, and suggested I make an adjustment in Firefox to accept a certain kind of image file. I copied the URL I was given, refreshed everything, and that still didn't work.I contacted them again, and they did email back promptly, but said they had to refer the problem to another support area. Hmmm...Not wanting to wait that long, I did a little research. The Solution: I experimented on my own for a while, and realized I was not using the most recent version of Firefox, so I upgraded to 3.6.10 on a hunch. 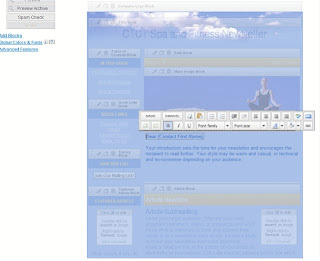 Sure enough, the new editor popped up in all its tool palette glory, and I was a happy newsletter publisher once again. Note to Constant Contact: You need to highlight the fact that the new editor only works with the latest version of Firefox. Remaining Questions: What about compatibility between Safari and the new Constant Contact? I'll be checking on that and writing a separate post shortly. If the program doesn't work, it will be a short post! I have a hunch there is a compatibility problem, as I read recently that Constant Contact is working on issues with Safari. The Good News: The latest version of Firefox (3.6.10) has some great new features, including speeding up your browsing time (I almost felt like a I had new computer at first), some great plug-in options like Screengrab, which enables you to save images of your entire screen or selected areas, ( a handy alternative to my beloved screen shot keyboard shortcut, command - shift- 4) and the latest WiseStamp (e-mail signature) compatability. The Bad News: I could not download PDFs once I had upgrade to the new Firefox. I kept getting an empty tag with an "x" in it. When I googled the problem, lo and behold I found literally hundreds of questions on web sites and forums, where people have been complaining about this for the last few months. I didn't see any solutions indicated, nor did I find any answers on Firefox or Adobe's web site, or for that matter, a simple way to contact Adobe (I didn't try to contact Firefox.) I also happened to be near the Apple store, so I popped in briefly and chatted with 3 salepeople who had no idea how to fix the problem, including one woman who hadn't used Firefox in over a year. So why was I referred to her? Hmmm. 2. A mini menu pops up. Type PDF. 3. 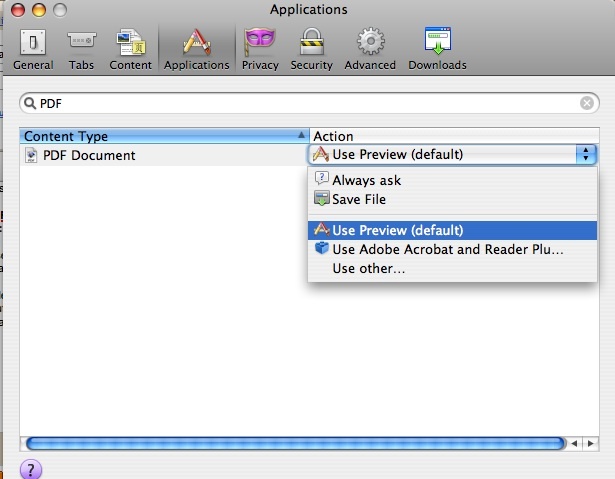 Click on the option that says "Use Preview (default)." It's interesting that the preview is indicated as a default setting, when I had to manually set it up. 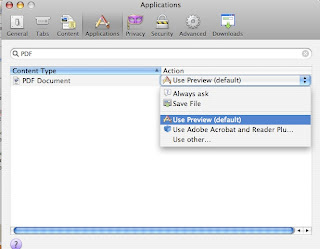 Note to Mozilla/Firefox: You need to include in your notes after users have completed the download, that they need to manually set the PDF Preview mode, or their PDFs will not download. The Good News: Blogger redesigned its template design features, so you can add better Share tools, more easily size and place images, use the new caption function, and incorporate enhanced graphics into the header. The Bad News: While I was glad to see more social media sharing tools added, they were tiny icons at the bottom of the post and I felt they got lost. Plus, I wanted to highlight Twitter and Facebook sharing, particularly with the "Like" and "Retweet" buttons. Not so easy to find out the how to's on this. 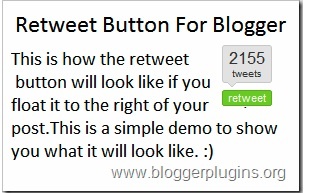 See bloggerplugins.org for customized code. I hope you found this post helpful. Have you solved any technical glitches recently that you'd like to share? Comment here!